I have to admit, I didn't know this track but I assumed this would be instrumental synthpop when I saw the sleeve. I was not wrong. Space Art is a French band that was formed by two friends in Paris in 1977. The group consisted of Dominique Perrier on keyboards and Roger Rizzitelli on drums. Their music was all about experimenting with new sounds on new machines. 'Onyx' was released in the summer of 1977 and reached number 22 in the Netherlands. 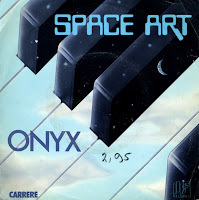 Space Art released three albums between 1977 and 1980, which have been released as a three cd box set last year.